Incumbent Doctor Who writer, producer and showrunner Steven Moffat has just received an OBE for extraordinary contributions to drama. He received his OBE at a ceremony at Buckingham Palace yesterday, Thursday 4 February. 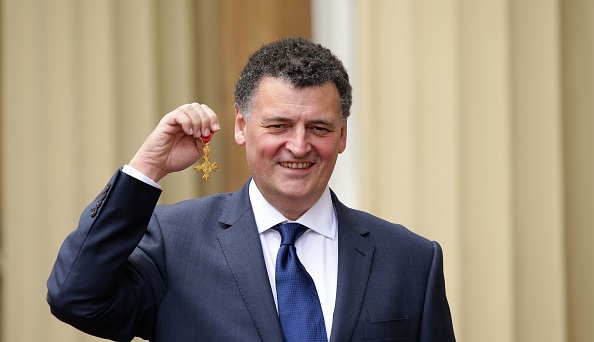 Moffat is now an Officer of the Most Excellent Order of the British Empire. The award was presented by Prince Charles. Moffat said he was “astonished” when he received news of the honour, but it is likely no one else was surprised by the richly-deserved award. Moffat already has a plethora of prizes to his name, including Nebula and Hugo Awards. He began writing for television with the widely-acclaimed Press Gang and later created Joking Apart and Chalk. When Doctor Who came back to television in 2005, it was Moffat’s writing that helped re-introduce the Doctor to an adoring public. By 2010, Moffat was in charge of Doctor Who and had reimagined Sir Arthur Conan Doyle’s famed detective stories as Sherlock with Mark Gatiss. Since Moffat took charge of the show in 2010, Doctor Who has become the crown jewel for the BBC. Moffat has the incredible talent to produce and write for two of the BBC’s biggest programmes – Doctor Who and Sherlock. “I’ve got not one, but two dream jobs so to get this lovely thing for already indulging myself in public, seems like an excess of good fortune,” Moffat told the Scottish Daily Mail yesterday, after being presented with his award. It was recently announced that Moffat will be leaving Doctor Who after its 2017 season, with Chris Chibnall, creator and writer of Broadchurch, succeeding him. Next articleCould There Be A Special Doctor Who Episode Heading Our Way?